Stacey and her husband Don moved to Texas in March 2007 from Colorado Springs, Colorado. She made her first skydive in June 1998, and was one of the first USA Instructors for Birdman International (BMI USA-007), but since 2004 she's pretty much a full-time freefall photographer/videographer at Skydive Houston just outside of Houston, Texas. 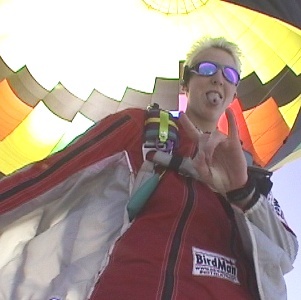 She has logged over 1600 skydives, over 700 of which are videography/photography work, mainly on tandem skydives. I also shoot various student skydives as well as the occasional "fun jump". When not jumping out of airplanes, Stacey loves to spend time with her "kids" - two border collies, Ziggy (age 4) and Marley (still a very young pup). She also has a siamese kitty named Sammie, and an orange tabby kitty named Velo. They make for great photography subjects since they are all very cute and have outstanding personalities. She's also interested in ice hockey, mountain biking, and motorcycles (1993 Suzuki GSX-R 600).